Paul Brown is best known as performing jazz guitarist. With albums like Up Front (2004), The City (2005), White Sand (2007), his collaboration with Marc Antoine Foreign Exchange (2009), and Love You Found Me (2010) he showcased his talents equally as singer and instrumentalist. But Paul is also a professional and in-demand producer/engineer with two Grammy Awards and more than forty hits for artists as George Benson, Al Jarreau, Kirk Whalum, Patti Austin, Norman Brown, Luther Vandross, Larry Carlton, Euge Groove, Boney James, Rick Braun, and Peter White. He is also a great mentor of saxophonist Jessy J supporting her career as producer and musician. His newest album The Funky Joint is just released on Woodward Avenue Records, a label founded by Mark C. Nordman in 2010. Brown is also connected with the label as A&R consultant. On his new project Brown is joined by guest musicians like Boney James, Bob James, Euge Groove, Marc Antoine, Jonathan Fritzen, Bob Baldwin and Darren Rahn. Longtime friend Jeff Carruthers, a smooth jazz producer and keyboardist with three Platinum and Three Gold records to his credit, shares the main part on Brown's album. 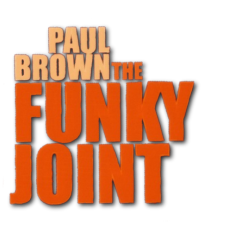 The Funky Joint celebrates Paul Brown's return to the melodious sound of his beloved Gibson L-5 guitar. While Paul performs the lead, Jeff underlines the melody with his wah-wah guitar. Horns and strings produce additional volume to the song. On As Clear As Day Paul welcomes back good old champs Marc Antoine and Boney James. Synth flute harmonies by Marco Basci round up this crispy track. The beautiful Montreux is located on Lake Geneva at the foot of the Alps. The Swiss town is also the venue of the famous Montreux Jazz Festival. Paul's tribute has an easy flow and an awesome hook. With an urban jazz approach comes the swaying Say It Like It Is. The bridge offers a surprising acceleration, before the song falls back to the lazy way of walking. From White Lion to Diana Ross Love Don't Come EZ always moves people. With his charming vocals guitarist Paul Brown contributes his own sight of view. The bluesy Tuff Times features Swedish newcomer Jonathan Fritzen on piano, who already made waves with his smooth jazz albums VIP, Love Birds and Diamonds. His next album will be probably released on Woodward Avenue Records. On Backstage Pass takes veteran pianist Bob James the keys. While his decorative jazz style is highly impressive, the song is too short to allow a desirable solo. Ya Dig features new star saxophonist Darren Rahn, who keeps the melody sultry and mellow. For the third saxophonist on this album Euge Groove Paul Brown and Bob Baldwin composed From The Ground Up with increasing effects. Finally Paul follows with I Get A Feeling in the footsteps of Johnny "Guitar" Watson. Some blues at the core this song brings fresh wind into Paul's album. Let's not be fooled by the title. 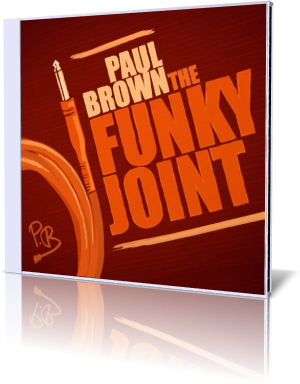 Paul Brown's The Funky Joint isn't funk, but another building of the architect of smooth jazz. Paul exactly knows how it works and he found the hook that you can hang your hat on.